The last thing a business needs is an on-the-job employee injury. An injured employee can’t work. Productivity dips and someone must be trained to perform in place of the injured worker. Then there is the matter of the physical and emotional pain stemming from such an injury. No one wants to see a hard worker endure a painful injury while trying to make a living. A workplace injury has the potential to spike workers’ compensation insurance rates. It also damages workplace morale to boot. If your business uses signs, banners or other visual displays, it is imperative to provide your employees with a completely safe means of hanging such ads. 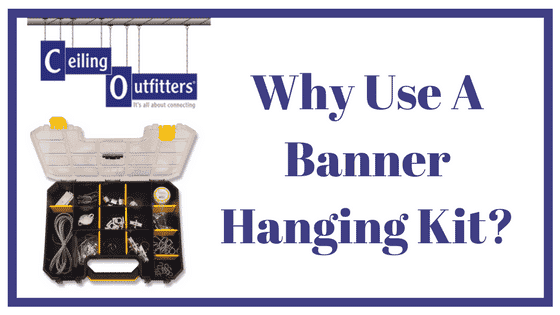 Such a solution has finally arrived in the form of our banner hanging systems. Our banner hanging systems were created to help businesses and other organizations prominently place advertisements and messages in a clear, secure and safe manner. 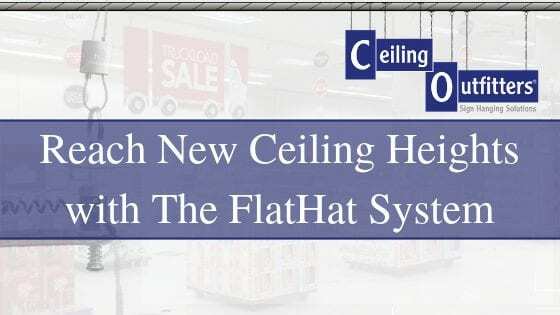 The system contains professionally designed products that ensure signs, banners, and other displays are securely attached to the ceiling. Provide your employees with one of our banner hanging systems and they’ll quickly discover installing signs and banners is quite safe and easy. The Clik-Clik Starter Kits are especially helpful and contain all the tools that facilitates the hanging of banners, signs and other ads at considerable elevations. Frame your company’s graphics with our E-Z Elliptical Aluminum Banner Hangers and your message will be presented in a professional manner that grabs the attention of those who pass by. It has a modern design with a lovely silver anodized finish. Even the plastic end caps are stylish. This banner hanger is available in 24, 36 and 48-inch lengths. The hanger needs an E-Z Snap Insert which connects to the edges of sign substrates like plastic, vinyl, fabric, and paper. Or, the E-Z Ratchet Fasteners are used with signs that have pre-punched holes on the upper edge. With either choice, simply slide the completed graphics into the incredible light and stylish E-Z Elliptical Aluminum Banner Hanger. Complete the hanger with our End Caps and slide into the top the Banner Hanger Clips that create points for hanging and attaching to the ceiling. The Clik-Clik™ Magnetic Sign Hanging System’s MagPole™ makes it easy to lift the sign to the ceiling and our strong ClikMagnets™ securely attach to suspended (drop) ceiling T-bar or steel beams in open ceilings. Don’t worry about assembly. Our engineers have gone to great lengths to make setup quick and easy. Our banner hanging systems were specifically designed to facilitate the safe, quick and easy presentation of signs and banners. Give our banner hanging solutions a chance and you won’t run the risk of employee injuries while attempting to position a sign or banner at an elevation at your store, restaurant, convention or another business event. Consider the seemingly never-ending fallout from a workplace injury. The injured employee misses time from work. Someone must be taught how to perform his duties. This requires time, effort and money. A workers’ compensation claim is filed so the injured employee can obtain medical treatment and possibly medical devices/equipment. This claim might increase your workers’ compensation insurance premium. If you don’t have a workers’ compensation insurance policy in place, the injured worker might sue you. Add in the fact that the injured worker could experience a tremendous amount of pain from the injury and the entire situation becomes an absolute mess. Even if the employee returns to work, he might only be capable of performing limited duties. 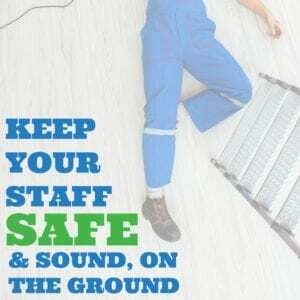 Do not underestimate the potential for a disastrous fall from a ladder while an employee attempts to hang a sign or banner. 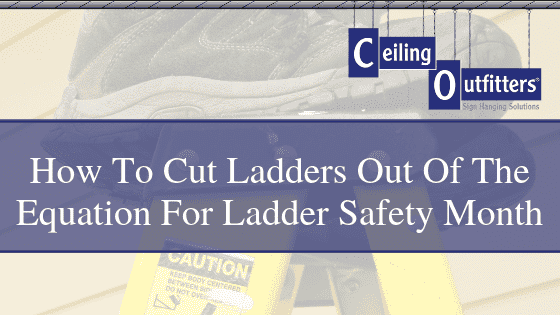 In fact, 43 percent of deadly falls in the past decade involved the use of ladders. 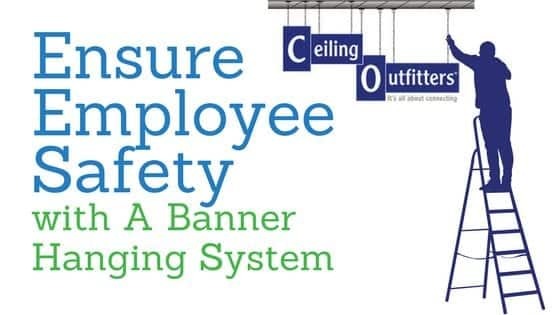 Make use of our banner hanging system and you won’t have to worry about trying to replace an injured employee across the ensuing weeks, months or years. There won’t be a need to alter your team’s schedule or find someone who is capable of filling the vacant job. The bottom line is our banner hanging system will save your organization plenty of money, time and effort.